I took the photo above last Wednesday. It got a lot of likes and loves on Facebook, so I thought I’d share it here. 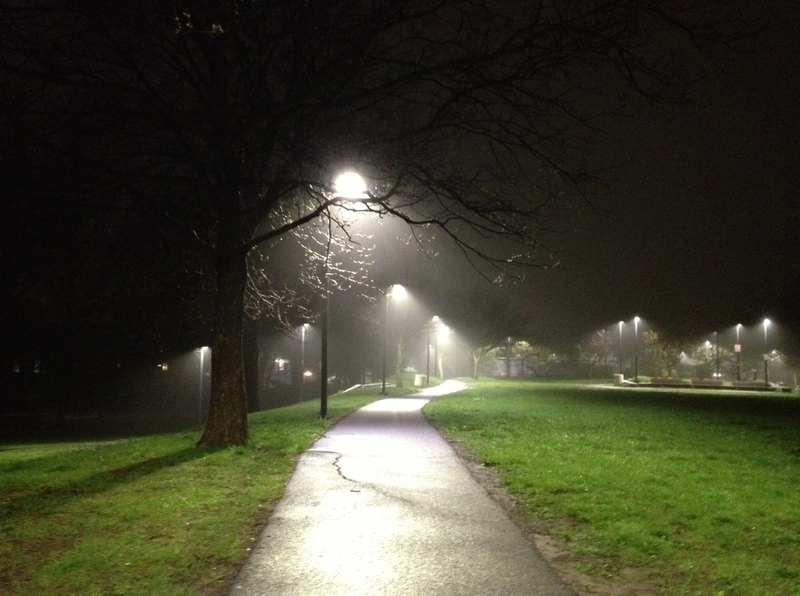 This is the Southwest Corridor Park in the Jamaica Plain neighborhood of Boston, where I live. When I got out of the subway that evening, I saw the fog creeping in and figured it would make for a good picture. I think I was right! It’s definitely atmospheric, and the moisture in the air helped to give sharp angles on the light coming from the streetlamps. 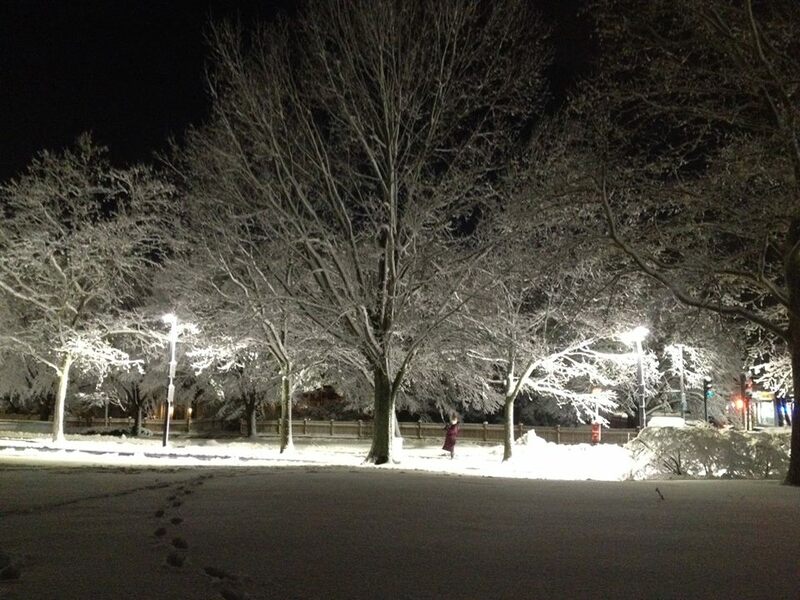 Here’s another side of the same park, only right after a snowfall last year that created a beautiful scenery, at least until it quickly started to melt and turn to mush! 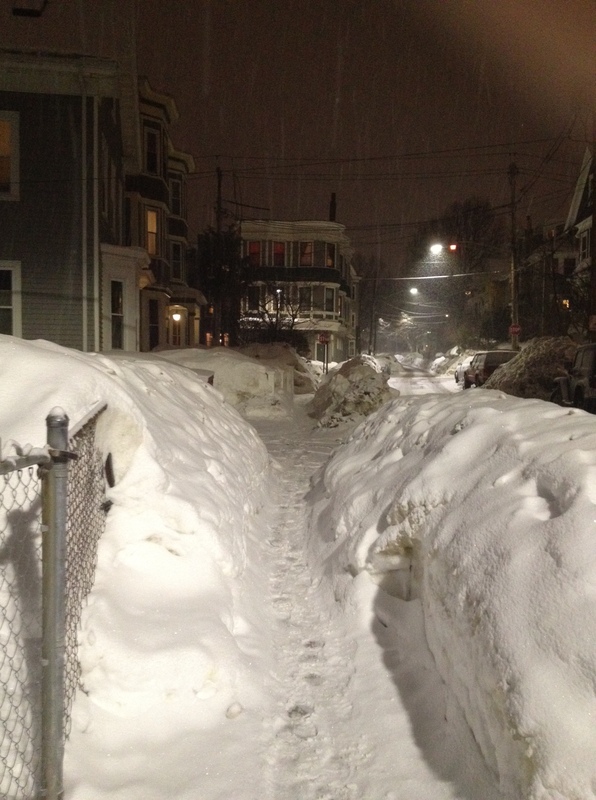 Of course, it wouldn’t be a set of Boston photos without a snow scene. This is from the infamous winter of 2015, when we got over 100 inches of the white stuff! Once again, we’re in my ‘hood of Jamaica Plain. The cross street ahead is my street. 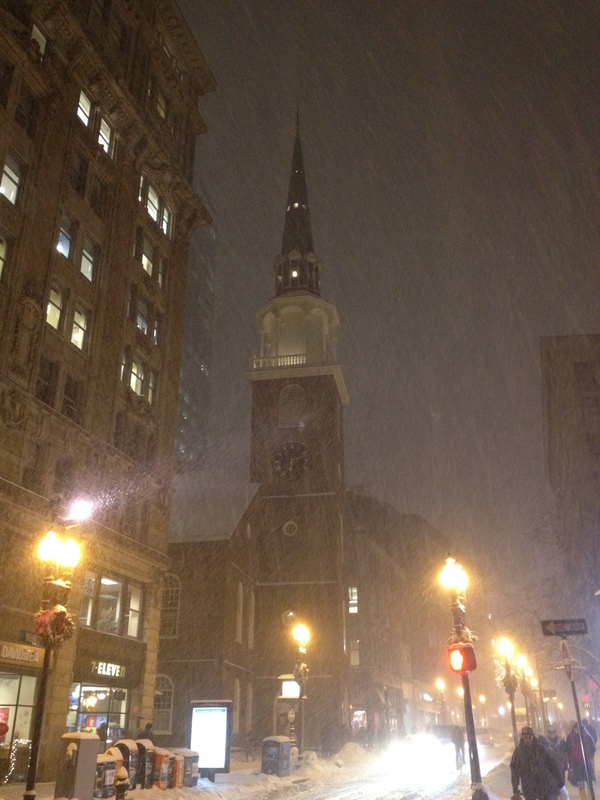 Another wintry scene, here looking at the historic Old South Meeting House, where the rebellious colonials planned the Boston Tea Party of 1773. Old South continues today as a museum and host for public events, such as talks by noted historians. 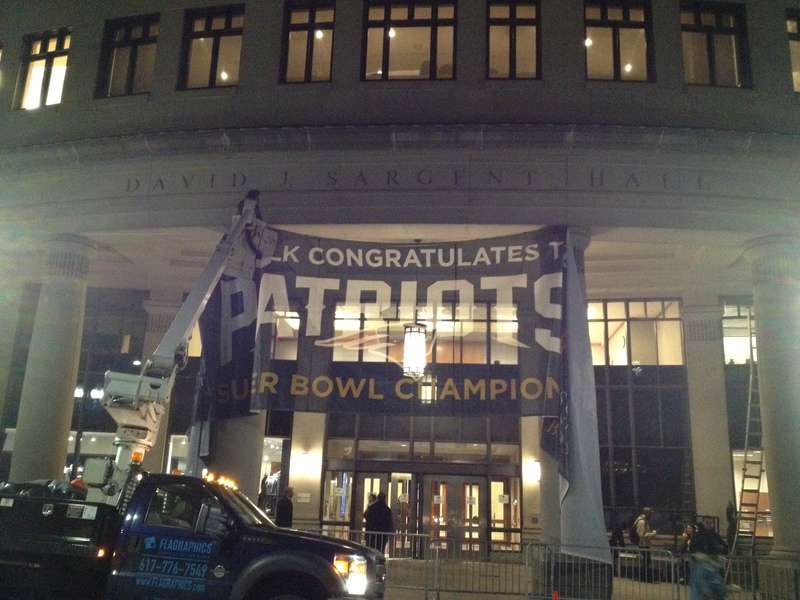 Here’s the university building where I teach, in the process of being decorated with a banner celebrating the Super Bowl champion New England Patriots earlier this year. Our building was on the parade route. This old, narrow city street — really, a walkway now — is in the historic Downtown Crossing part of Boston. 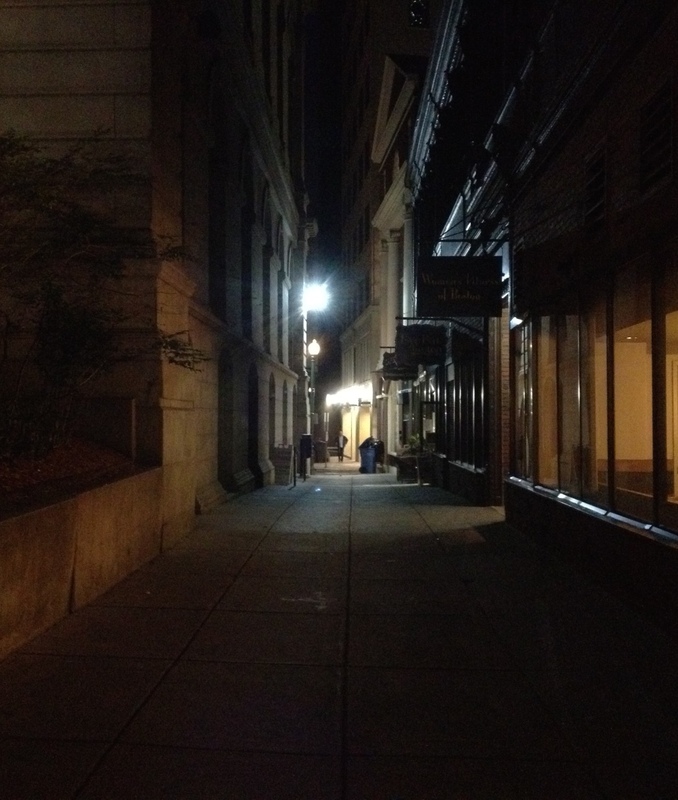 Cobblestones have been replaced by modern sidewalks, but it still has that very old look and feel, especially at night. 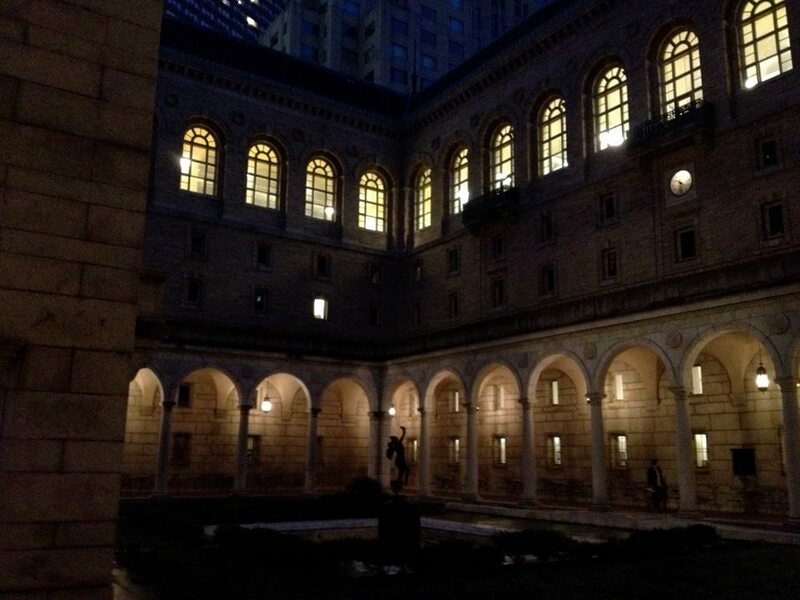 As some of my pals on Facebook will attest, the Central Branch of the Boston Public Library, located in the city’s Back Bay neighborhood, is one of my favorite places to work. Here’s an early spring shot of the library’s Italianate courtyard, with snow still on the ground.